It’s a pleasure to be in Michigan, and it’s nice to see that it’s stopped raining and that the Detroit kids are back in school. The story I’m going to tell you is the history of the education reform that we did in Edmonton. I’m not here to suggest anything that you should do in Michigan. That’s not my work. I can only describe the work that we did in Edmonton over the last, say, 30 years. I might just caution you that I don’t think Edmonton has anything unique about its staff that caused us to be more inclined to reform ourselves than anyone else. My perception of our district is that at any given point, if it never got better — ever — that would have satisfied many in the system just fine. A former superintendent in Edmonton looked around the system one day and realized that no matter what happened in our school district, every year the state government would give us more money. You could almost bank on getting more money every year, and we would spend whatever they would send us. And if parents were happy or unhappy, well, that was nice or not nice, but it didn’t really matter. So our previous superintendent wondered, What lever could we move — what cog could we turn — that would change behavior? And one of the things that we decided to do about 32 years ago — something that everybody in the central office was horrified by — was that we would let all parents in Edmonton choose whichever building or school they would want their children to go to in the city. Now just so you all know, Edmonton is a city of about 1.1 million, with a core city surrounded by some suburbs. There are two public school districts occupying the same ground in Edmonton. Kids can go to either system. So today in Alberta — which is like the state of Michigan: Alberta is a province; Michigan is a state — the money follows the kids. All of the money comes to the school district, and then wherever the child goes to school, the money follows the student. If a student says, "I want to go to a charter school," the money will follow the student to the charter school in total. If a student goes to a private school, two-thirds of the money follows the student to the private school. When we started our effort to try to make the system more responsive to its customers, we opened up all the schools in the system to every kid. Today in 2006, 57 percent of students do not go to their "home school." They will go somewhere in the system, but they will not go to their home school. And we provide subsidized passes on the city’s transportation system to make sure kids from ages 5 to 19 can access any school in the system. To make it even more attractive to attend our system, we have about 35 "programs of choice" dotted throughout the city in multiple locations. I would reckon about 40 percent of Edmonton students attend a "program of choice." A program of choice might be Chinese language and culture. It could be performing arts; it could be science and technology; it could be a form of methodology like project-based learning; it could be a military academy; it could be a hockey school; it could be a school of French immersion; it could be Christian education, Jewish education, Arabic education and culture; it could be whatever parents want, because if we didn’t offer it, the parents would collaborate and develop a charter school. Our goal in Edmonton Public Schools is to make sure there are no private or charter schools. It’s the Legislature of Alberta that decided that they would fully fund charters and partially fund private education. The government of the day had almost all the seats, and they decided to fully fund charters and partially fund private schools. The rest of the school districts in the province said, "Let’s kill the legislation," and we said, "Let’s out-compete the private schools and charter schools, so that no one will want to go there." And not only that, there are now virtually no charter or private schools in metro Edmonton. There may be five or six wee little ones. The three mother ships of the private school business in Edmonton all asked to join us. The teachers union was horrified that the three biggest private schools were Christian schools and that they said, "Could we join you?" and we said, "Well, we’ll see." The criticism of the teachers union was that we would be connecting church and state. So my argument was, OK, fine, let’s say there are 15,000 kids in Christian education schools right now that don’t belong in the public school system. None of those teachers are unionized. None of those teachers make a wage consistent with public school teachers or benefits. None of those teachers are paying fees to the teachers union. If we brought 15,000 kids under our tent and all the teachers that go with them, what would that do to your teachers union? That would swell the ranks of the teachers union by hundreds of teachers. So the first Christian school came in, and the world didn’t end. Two years ago, we brought in the third one. The school board didn’t ask a single question the night this superintendent brought a recommendation to the board to adopt the third Christian school, because the world hadn’t ended, because our numbers had swelled, because we drained every single Christian education school for a hundred miles around and the kids have done well. And the world as we knew it did not end. I want to share that with you because we’re merciless in our city about competing for kids, and we don’t apologize. And we think having a child in a public school is better than having a child in a private school. We think having a child in a public school is better than having a child in a charter school, though we’re not against charter schools. Keeping Schools "On Their Toes"
So how did our schools respond to the fact that kids could move from one school to another? Well, first of all, our central office planning staff said, "How should we reorganize the district if parents have control over where their kids go to school?" But we’ve now been doing that for 32 years, and so far that hasn’t shut the system down. Had you listened to our central office bureaucrats, they would have told you (a) that parents were too uninformed to pick the schools for their children, and that there would be vast dislocations if parents had choice, and (b) that parents would refuse to go to weak schools, and that would be a bad thing, because, How would we keep the weak schools going (laughter) if nobody wanted to go to them? That’s a true story. What do we do with the weak schools that parents don’t want to send their kids to? Well, I say there are two things: You can make the school better, or you can shut it. We had a school in Edmonton that was designed for 1,300 kids; there were only 300 left. A thousand parents already closed this school by moving their children to other schools. That hadn’t occurred to people. In Edmonton, the parents are in charge of which schools survive and thrive. So the board did vote to close the school, but in my view, what closed the school was the failure of the school to retain the children either through a lack of good programming or through a lack of good discipline or better teaching. It’s not magic keeping a school open in our city: You just have to do a good job. By the way, parents in Edmonton don’t think they have it lucky. It’s like having running water to them. My grandparents thought running water was a wonderful thing. If I said to my son, who is 27 years old, "Isn’t it wonderful that we have running water?" he would look at me and lock me up. That’s not an innovation in 2006. It’s not an innovation in Edmonton in 2006 to have school choice. It’s just the way we operate. We do not use the word "privatization"; we do not use the word "competition"; we just want to keep our schools on their toes. We do not want to take for granted that these parents trust us with their children’s lives and that teachers have the power to transform lives. And why shouldn’t parents, who are the most invested people, decide? Interestingly, if we have a poor school in a poor neighborhood, we will very often locate a program of choice in that neighborhood, so that we have rich kids traveling all across the city right down to the center of the city, where our poorest communities are. We don’t put all of our programs of choice in affluent neighborhoods. We very deliberately try to build up older parts of the city by having our performing arts K-12 school, our most famous performing arts school, located right in the city center next to a row of pawn shops. Children come from all over the city and other parts of Alberta and other parts of Canada to attend this school. One of the challenges is whether kids get to live and go to school with kids from other economic neighborhoods. Can you make a law to force them to go to school together, or can you induce them to go to school together because the program is so compelling in that school building? Notwithstanding what I said, we did other things to try to make our schools more responsive to teaching young children and doing a good job. One of the things we decided to do back in 1976 (and we’ve done ever since) was to send 82 cents of every dollar we collect from the state out to the schools and let the schools decide how best to deliver education in their building. They no longer had the argument that somebody downtown makes all the decisions and they were just following orders. The central office used to make all the decisions about what schools got. Now, schools decide how much staff, what kind of textbooks and software, and what kind of teaching strategy, instead of having some supervisor downtown making those decisions. We piloted that in 1976 with seven schools. Central office said that we couldn’t give principals money and authority, because they are either incompetent or immoral and we couldn’t trust those guys with the money or with the decision-making. But we said that we trust those people, those men and women, with the children, so let’s see what happens. Well, the pilot was so popular that in 1979, all schools in Edmonton received 80 cents on the dollar. In 1995, we took the rest of the money out of central office for all of the services and supplies, equipment and products and sent that money to schools. Even the trades money went to the schools, so that schools could say: "I no longer have to get down on my knees and beg the maintenance department to come paint my building. I now have some money to make that happen. And I’m going to decide based on past performance whether I want to go to our purchasing department and ask for internal forces to paint it or whether I would like to put the thing out for tender and maybe get a better price from a painting company in Edmonton." That caused some distress in our central office, because that same idea went for a teacher reading-specialist; that went for a teacher psychologist; that went for all of the professional development that teachers access. Everything was going to be decided at the school level. And the staff in central — and it was my job to do this transition — went through all of the stages of death, dying and grieving. Their conclusion was, "Oh no! No one would ever buy our services." I said, "Why is it that people would access your service when it was free, and they wouldn’t be willing to pay for it?" It’s no more expensive when it’s decentralized than when it’s controlled centrally. Well, they had no confidence that schools would buy their services. Anyway, to make a long story short, schools more or less buy from inside the organization, but very often buy from outside the organization, either because they can’t get timely service, they can’t get quality service or they can’t necessarily get the person they believe will do the best job. One of the things I remember was from a meeting with our tradesman union. They said to me, "Well, if the schools have the money, they won’t spend it on maintenance; they’ll just lower class size." I said: "Yeah, but we have these maintenance standards at the district level that they have to meet, so the building has to be healthy; it has to be safe; and they can’t buy cheap stuff that’s below-grade. There are certain specifications that they have to meet." You know, the schools not only spend 100 percent of their trade allocation; they spend about 102 percent to 105 percent of their trade allocation! Schools are spending their money. But that was one of the beliefs. The schools said to me, "Well, what happens if a plumber comes out, they don’t do good work, and the pipes don’t work? What would happen in Edmonton Public Schools if you got service that didn’t work?" "Well," I said, "there are two choices: (1) Don’t pay for it; (2) Make the plumber come back and fix it." That was considered radical in our system. When everything was free, it was like Poland before the fall of the Berlin Wall: We pretend to work as long as you pretend to pay us. So you might have somebody come out to the school to provide services from central offices. They would come out repeatedly, and the service wouldn’t work — so, oh well, we never thought it would; besides, it’s free. When schools got the service money, some services almost died. After-school teacher workshops virtually disappeared. Do you know why? First of all, they were worthless to start with; they didn’t change teaching practice; they were free; sometimes only one person would come, and we would spend $400 to $500 to provide a workshop for one teacher. So what the schools started saying is, "If we’re going to spend tax dollars that we control and we’re spending them outside our classroom for services, we need to have services that work." I didn’t think that was an immoral notion, but it was considered radical in our system at first. The schools tripled their expenditures on technology services. In the first year, we had a cap on technology services when they were centralized. When we gave the schools the money, they tripled it. For years, schools begged us for more social workers, and every year we would try to hold the line on how many free social workers we would provide to the schools. And then they would go to the school board and complain that the administration was hard-hearted because we wouldn’t give them, I don’t know, 500 social workers. Ironically, they reduced the social workers to six when they had to pay for them, because they realized you can’t get social workers from the state for free. Maybe it isn’t the work of the schools to provide social work services to kids. A lot of people believed that if you introduced the notion of choice to the system, the results would automatically be good, or that you could absolutely count on parents to make wise consumer decisions. Well, I can tell you that parents will send their kids to a bad school sometimes, even though they have a choice to go with another school. So we decided we would have to start a very rigorous system of measuring student achievement — and not just measuring it, but reporting it. And we ran into a lot of objections, with people saying, "First of all, you can’t measure anything as complex as learning; second, if you give parents data about school performance, they are too stupid to understand it; and third, people might start choosing their schools based on how well they perform." But I thought this was a legitimate measure of performance that people might be interested in — whether kids might be learning to read, write, think and compute. We also measure annually parent, staff and student satisfaction with the performance of the system as a whole and with each individual school. Every year our parents, staff and students participate in an anonymous survey by school on everything from their satisfaction and confidence in their principal to their satisfaction and confidence in the safety of their children to the quality of the teaching: Does your teacher help you when you need it? Are the people in the office friendly and accommodating? Do your children get extra help when they need it? Are you satisfied with how demanding the teaching is in this school? Do your children receive enough, too much or sufficient homework? Questions of that nature. All of the results are published annually, and schools set targets to improve the levels of satisfaction in each of these areas every year, or at least key areas every year. So when we found out, the first thing that we decided to do was publish it everywhere in the city. There was great horror about it. How could we, the famous Edmonton Public School system, tell people how badly we were doing? And my position was we need to tell everybody how badly we are doing. So we might lose 10,000 kids. We deserve to lose 10,000 kids. I said: "Parents are very forgiving. If we tell them, ‘We are not doing a good job,’ and we tell them, ‘Here are the benchmarks for improvement over the next five years, and here are the plans we have to get better,’ chances are they will forgive us." So we put it in our elevators, and we put it on our answering machines; we put it in the newspapers and magazines. If you call the system today, and you are on hold, you’ll hear about the history of our graduation rates for the last five, six years. By the way, it’s much higher now. People didn’t pull their kids out of our system. Our staff was very unhappy. They thought the statisticians were dead wrong, and we had to explain to them how the data were collected. They agreed eventually that the data were valid. It turned out in our system that we had a ton of data from both the provincial examinations and the district examinations, but it was put in drawers, and nobody used the data to improve teaching, or more importantly, to improve leadership in the schools. So when we gave all that money to our principals, they gladly took it, and it was a lot of fun until we decided that not only do you get the money and the authority, you had to then be accountable for the results. And what are the results? The children learned to read, write, compute, think, behave and learn sciences and that sort of thing, and we needed to measure stuff that was really important. I realized two things — and I hate to tell you, because it sounds so embarrassing, and it would never happen in Michigan. After I got two degrees, I started teaching grade-six kids in Prince Edward Island, and I did not know how to teach reading very well, because nothing I had learned in college had helped me learn to teach reading. I’ve taken reading courses, but they still didn’t help in how to teach reading. But it turned out that it didn’t matter, because when my principal came in my room, she didn’t notice that I couldn’t teach reading. I never told her that I didn’t know how to teach reading. Nobody else in the school admitted that they didn’t know how to teach reading, and in year three, I still didn’t know how to teach reading. So I moved to Alberta, which is 3,200 miles away, took a master’s degree in administration and then took eight — no, nine — more reading courses, so I thought, Now I have about 12 reading courses. I still didn’t know how to teach reading. Of course, there was no plan that anybody who took reading courses would actually learn how to teach it (not in Michigan; I’m talking about Canada). So I started teaching in an Edmonton school. I still didn’t know how to teach reading to kids who were hard to teach reading to. My principal didn’t notice; it didn’t matter. And I realized, we graduate teachers, but teachers are so unsupported. We graduate teachers from colleges; we certify them; we put them in rooms; we turn the key; and we leave them there 30 years. And then society bad-mouths teachers for the next 30 years. Have you ever heard people put teachers down? People routinely put teachers down. If any one of you has a child or has a partner and if that child needed a new heart or that partner needed a new heart, let me ask you this: Imagine you went over to the nearest hospital, wherever it is, to stand at your loved one’s bedside as they awaited an operation for a new heart, and the physician came in and said, "Don’t worry, everything is fine." And you said, "May I ask you something, sir (or madam)? I want to know how up-to-date you are on surgical processes and medicines and therapies related to heart procedures." And the response was, "Well, I graduated in 1967, and I haven’t read anything since." Would that raise or lower your confidence? You would be outraged. You would probably refuse to allow that doctor to perform surgery on your loved one. 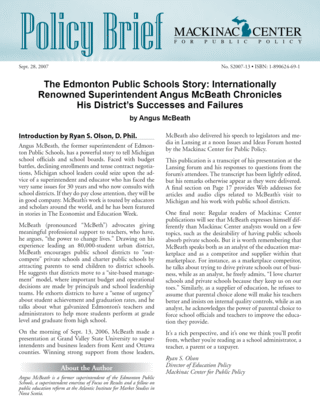 It may be that bad in Michigan — I have no idea — but certainly in Edmonton, there were teachers like that who in their 30th year of teaching had not learned new teaching strategies, new methodology, new ways of teaching, because it wasn’t required of them. So we started a systematic program in Edmonton about six years ago to raise the quality of teaching and leading. Now principals said, "Well, it’s not our job to be responsible in Edmonton for the quality of teaching in our rooms." But we said, "You have the money, and you have the authority." They said, "No, no, but we look after all that other stuff" — and I realized the most important people in schools are teachers, because they have the power to transform lives, and only they have the power to take poor children and make sure they have a chance of learning and graduating from high school. If you don’t graduate from high school in Canada, you’re doomed. You’ll make bottom wages, you’ll never get a raise, nobody will give you a promotion, nobody will invest in you, and you’ll have a lower health outcome, even in a society that has public medicine. Chances are you’ll be unemployed or underemployed and will earn low wages for life, and you will not participate fully as a citizen. That is a documented outcome of not graduating from high school in Canada. Now it may be different here; I doubt it. So I said to principals: "We have given you the money; we have given you the authority; central office now works in support of you. Now you need to be responsible for the quality of the teaching in the classrooms. And your job is to be in the rooms 50 percent of the instructional day." Now had I said, "Your job is to put a spaceship on the moon in nine years," they would not have received that information with more horror. But I said: "If you don’t have experience being in rooms, why would you go in rooms? You should be in rooms because you need to support teachers, you need to measure them, you need to coax them, you need to observe them, you need to figure out what kind of professional development they need — hopefully professional development that works; that would be novel! — and you need to make sure that you give teachers the kind of feedback that helps them get better at their work." If you were alone with the kids for 30 years, you wouldn’t be learning anything from the kids. It’s not the child’s job to teach you how to be a better teacher. Now, teaching is the roughest work on the planet. It may be harder to be a soldier in front of the enemy in Iraq, but chances are, we’re not going to ask those soldiers to be there for 30 years, at least not the same ones. Whereas teaching is absolutely relentless work — exhausting, discouraging. We don’t always give them motivated kids. Oftentimes we ask them to teach kids whose parents are not interested in how well their kids are performing. In order to get better results, you need high-quality teaching, but you also need high-quality leading and building. We realized that we had to teach teachers how to teach. We couldn’t rely exclusively on teacher colleges. The principals needed to be in rooms every day, and we had to train our principals how to do that work. If we didn’t know how to do that work, we had to bring in external consultants to help us. We actually had to admit that we did not know how to do that work ourselves. What have been the results? About 90 percent of our grade-school kids read and write at grade level. We wanted that to be 100 percent. I don’t think we should stop working until we hit 100 percent. People tell me that that’s impossible. I would respond, "What should the standard be for United Airlines for how many planes take off and land without killing the passengers?" If I phoned them up and they said "80 percent," I’d be flying home on US Airways. I know that United won’t admit that their standard is lower than 100 percent, and United may have had an air crash in the last 10 years, of course. But if you say that every kid has got to learn to read and write and think and compute, and you say every United flight has to take off and land without killing the passengers (a reasonable outcome), then chances are that that will change the way you allocate resources, what you measure, how you maintain things, how often you replace the equipment, what kind of professional development the staff needs and what kind of standards you set. So we have had substantial luck in changing our results, but it has been through a level of pressure and support for our teachers and principals to make sure they perform. Has anybody surrendered? Have we lost a lot of people who don’t want to be principals in the system? We have a line of people who are dying to be principals in Edmonton. We have at least a two-year training program just to get in the door to be a principal and then multiple years of training. If you want to get high-quality results, the people who fix my car shouldn’t get more training than the people who are teaching my son. So we have to invest in the right work for improving results and not assume that mere choice is enough to change the system. Well, I’ve talked enough. I just wanted to give you a little history of the work we did, though we did more than that, and by the way, it was really hard. Every change I talked about, everybody resisted. Resistance is natural. It was really hard. We had to collaborate with our union. The most senior people in the system had to be reassured, because we were the biggest barriers to reform, and we tended not to want to do any reform work. We said we did, but in reality, we didn’t, because it’s really hard to change. It’s like going on a diet and exercising, right? Everybody in this room every year pledges we’re going to eat better, exercise routinely. It’s hard to do that. It’s hard to bring about public school reform. Let me ask you: Is the result worth it? Which children in Michigan would we not want to be successful? Imagine that we brought them in this room. Would we want to sit down with them, maybe telling them when they’re 6: "I need to bring you in and talk to you today, Billy, because you’re not going to graduate from high school. You’re going to lead a life of poverty. We thought we would tell you now instead of letting you find out when you’re 20." Now you wouldn’t do that, right? If you brought 6-year-old kids in and told them, "You’re done," people would label you as inhumane and cruel. My only added view is that I think it’s inhumane and cruel to let them know when they are grown up. It’s much harder to rectify those things when a kid is 20 than when a kid is 6. You’ve been a wonderful audience. Thank you. Introduction by Ryan S. Olson, D. Phil.